Discussion in 'Dell XPS and Studio XPS' started by tiger501, Oct 30, 2017. 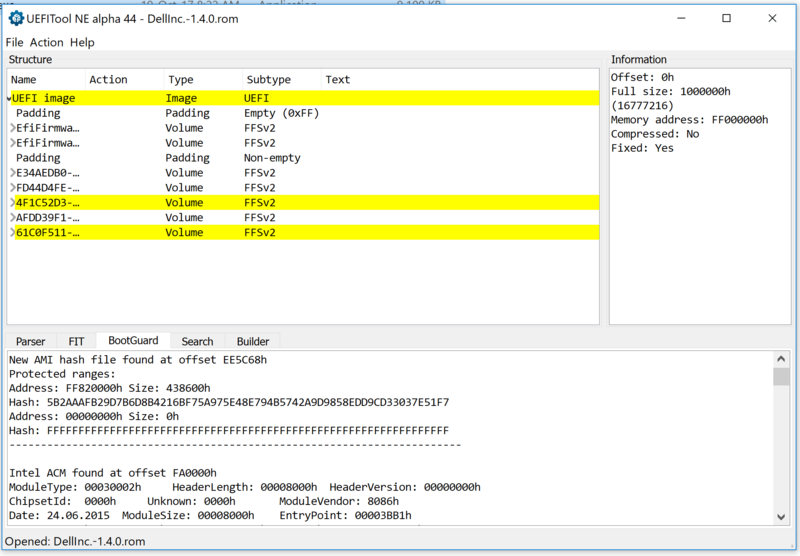 With this tutorial we can access and modify advanced BIOS options in modern Dell Laptops with UEFI BIOS ( XPS 15 9550/9560).I personally tested on my XPS 15 9550 and its working properly so far. First we have to Extract our BIOS from the laptop.Then we can change values. Run UEFITool_NE_A43.exe Go to File>Open Image File.Open the .rom file we saved earlier. Now go to Action> Search ... > GUID and enter "899407D7-99FE-43D8-9A21-79EC328CAC21" and click search. 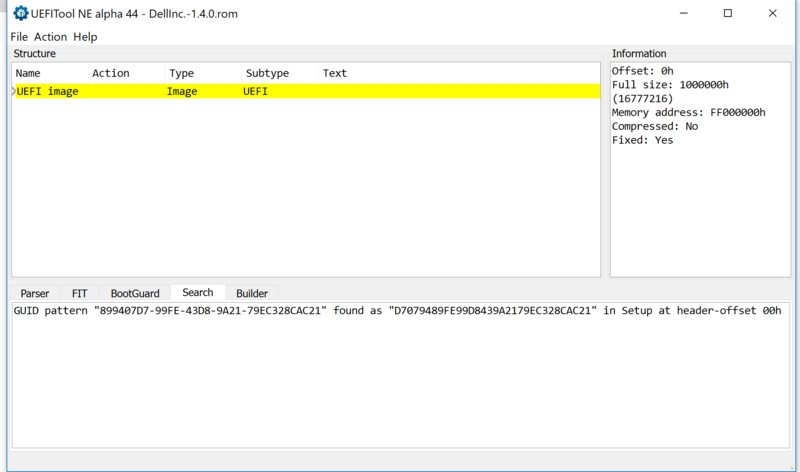 Double click on "GUID Pattern....." message below,Right click on text "Setup",Click "Extract as is..." and save file as "setup.bin"
Run Universal IFR Extractor.exe and select the setup.bin file we saved earlier and click Extract.Save the file. 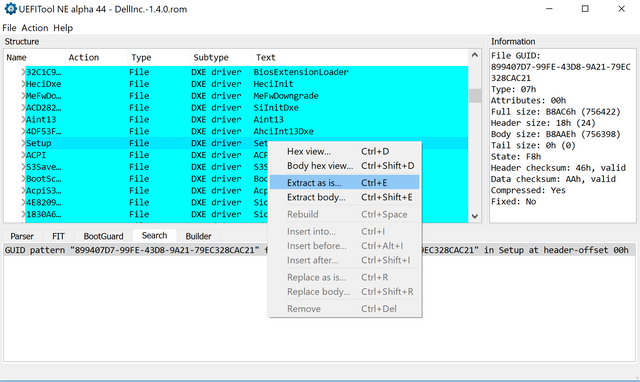 We have successfully extracted our BIOS Options.Now open this "setup IFR.txt" file with text editor.You will find add the variable adderss and options in this. Now we changed variable 0xD8 to 0x1 and speed shift is enabled in my laptop. You can now try changing other variables if your are curious and let us know. improwise, Rockstar75, custom90gt and 1 other person like this. I think you can hold the power button for 30 seconds to start the BIOS reset (charge lights will flash during) to avoid opening it up. The biggie would be enabling the menu options in the BIOS to allow us to change values without having to boot into EFI shell each time. Rockstar75 and pressing like this. Would that enable the option in the BIOS? I've already gave detailed instruction of extracting BIOS and getting variables.That speed shift change was just an example.I think people who will follow this will surely know what they are doing. Also i tried holding power button to reset BIOS,didnt work for me.I had to remove CMOS to reset.I also read on forum Fn+Power button resets the bios too and it didnt work for me either! Good to know, shame it doesn't work holding the power button, but at least you got out of the brick! what did you do wrong to brick it? I am having throttling problem after few months of buying this laptop.Never had a solution except uninstalling Intel DPTF and Using ThrottleStop.So i enabled "CPU DTS" value from BIOS and it stuck on Dell logo ...Strange.Also more stranger thing is when i checked value of "DPTF" variable,it was disabled by default but we all know it isn't! Can somebody post a download for the xps 9550 1.4.0 ROM Bios file ? I updated to 1.6.1 and can´t suspend the laptop anymore... directly resets... i need to downgrade it directly from Bios upgrade option , can´t downgrade it anymore... so i want to force a reflashing with the 1.4.0 . Or if there is any other option to downgrade, i appreciate the reply ... can´t find anything on google about it... Would appreciate it, thousand thanks ! Dell has a page with many older drivers and bios saved. Search my posts for a link.